These are too cute. What perfect little holiday gifts. Very creative and nice little project. 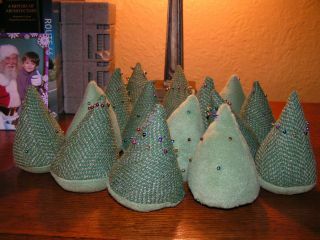 I love the trees and your craft night idea. A few friends and I have been talking about having a little craft night at my house where everyone brings their own portable work-in-progress to do. That chocolate dessert sounds scrumptious. I did comment on your give-away but I always feel awkward when doing so. I don't want you (or anyone else posting a give-away) to think I'm only commenting in order to try to win. So usually I leave a note that says something along the lines of "please don't worry about including me in your drawing." Because, honestly, I would have commented anyway about the lovely item you're offering. what a great idea! I should see if I could hold a craft night before the holidays set in--although I guess I'm running out of time!